After a long search for the perfect place to call home, this breathtaking property with incredible flower gardens and a park-like setting drew Pat and Melissa Chieffalo to purchase their Ivoryton, CT home. Melissa, who is a classically trained chef, had wanted a new construction home and had to be convinced and persuaded to opt for this antique showpiece that had an unsightly small dark kitchen that was stuck in the 1990’s. Full of character and charm, the house is an eclectic mix of an old style 1809 farm home together with a newer 20 year-old addition. It was a rare find to discover a home of this era with such a large, open floor plan. Part of the agreement between Pat and Melissa (who is self admittedly obsessed with cooking entertaining) was that if they purchased the home, she would be enjoying her dream kitchen within the first year of homeownership. The Chieffalos brought their wish list to Covenant Kitchens & Baths in Westbrook where they met with owner Gerard Ciccarello and shared with him Melissa’s very specific list of “must haves”: generous work surfaces, storage, more task lighting and a tranquil natural style that gives nod to the period of the home without sacrificing amenities. Ciccarello usually tries to encourage homeowners to live in a space for a while and see how the kitchen functions for them but it was understood that the Chieffalos knew what they wanted and that the existing space was barely meeting their needs. The original kitchen was dark, outdated and too small for the room size. Melissa described it as “a huge dark dance floor with a kitchen as an afterthought”. Space was not well utilized for cooking or entertaining with an odd shaped island that forced the kitchen into the corner of the space. A door to the porch rendered the kitchen a thoroughfare and reduced the wall space that could be better utilized to house cabinetry and appliances. Repositioning the porch door to the hall allowed Ciccarello and his team to tuck the refrigerator into the corner where the door previously was. It also created a wall for a beautiful focal point consisting of a large wooden hood over a gas range top. The backsplash feature of natural stone mosaic tiles pulling from the tones of the cabinetry and the countertops, completes the look. Melissa desired double ovens but the layout of the room was not amenable to the traditionally stacked units due to limited wall real-estate. The solution was to have identical under counter ovens installed in the island on either side of a drawer microwave. The drawer microwave removes this appliance from the main view of the kitchen which is necessary to keep the overall space reflective of the period. “Due to the age of the home, and there being no space between floors to incorporate recessed lighting, we needed to be creative with lighting solutions,” Ciccarello notes. For natural light, in addition to the porch door relocation mentioned above, window configurations were altered to add more of this effect. As for task lighting, this was accomplished via: under-cabinet lights to the left and right of the range, five oil rubbed bronze lanterns installed on the sink wall between existing hand-hewn beams, three mini bulb chandeliers over the island, and a wrought iron chandelier over a nearby table. A few of the features of the existing home such as the wide plank pegged pine floors and the hand-hewn ceiling beams were beautiful and only required some touch-up and TLC to become an integral part of the design. Painted Cabinets are Sherwin Williams’ “Urban Putty” - a soft khaki neutral which is a departure from the ordinary white farmhouse kitchen. Perimeter countertops are Black Cosmic leathered granite and are nearly the reverse color and pattern of the leathered Azurite granite of the island top. The spacious island provides a generous work surface and seating for entertaining guests and it also serves to unite the room into one cohesive space. The work triangle of sink, stove and refrigerator works perfectly for the homeowners. Beautifully lit hutches that match the kitchen cabinetry flank the opening of the dining room, utilizing the space for display and storage of occasional dishes and linens. “We bought it knowing the right kitchen would make all the difference and it really has become the heart of our home. Everyone who visits tends to linger here. It’s truly better than we imagined,” Melissa and Pat concur. Outdated oak cabinets, a small island with a tiled top and inadequate work surfaces were the impetuses these homeowners used to make changes to their quaint Madison summer home. With no true focal point and double entrances to the kitchen work space, the original layout became a busy thoroughfare and did not give the chef of the day enough space to create his or her signature dish. In order to remedy these design challenges and drawing on their passion for color, the owners became inspired by an eye-catching, pumpkin orange Viking 48 inch range that became the heart from which the new look began to evolve. “Cheerful” was at the top of the homeowner’s wish list as was a more functional and spacious kitchen. The home is owned by 2 brothers and their wives and summer draws a large crowd where relaxing and entertaining go hand in hand. Both families enjoy cooking, but the original kitchen lacked work space for more than one chef at a time and did not have an efficient traffic pattern or necessary amenities. The new kitchen by Covenant Kitchens & Baths in Westbrook, is light and spacious and has deliberate and practical design elements. Appliances are an integral part of the design and along with the stunning orange range include the following in stainless steel: 24” Sharp microwave drawer in the island, a Sub-Zero refrigerator, wine cooler, under counter ice maker, and Asko dishwasher. Closing one section of perimeter provided more work surface and made walking into the kitchen an intentional decision rather than devoting kitchen real estate for use as a walkway. Vibrant Fiestaware featured in the space is the homeowner’s passion and the new kitchen is equipped with the perfect open shelving to display some of their sizable collection. The neutral grays and whites of the surroundings facilitate an easy change of decor simply by selecting other dishes. Before: Cabinets were builders grade oak and counter tops were tile. After: White cabinets and grey accents are perfect with a pop of vibrant orange. White perimeter cabinets and a gray island function as a backdrop, showcasing the pop of vibrant color and act as an anchor in the space. “People are sometimes afraid of committing to color so the trick is how to use it,” says Kira Van Deusen of Covenant Kitchens & Baths. “Here we used orange as the key color and due to the white and gray canvas, almost any other color easily could be substituted and the room would still look great,” she adds. For example, Viking offers a ‘skin’ for some of their models, allowing the home owner flexibility in changing the color of the range as time and tastes evolve. Before: The space seemed dark and lacked a focal point. After: The Pumpkin Orange Viking range gave the room a great point of interest! Interest is created in several ways: through the use of texture in the chosen materials, touches of beadboard, and honed granite and tile keep the space interesting. The tile covering the entire first floor was in great condition but there wasn’t enough surplus to accommodate the kitchen floor renovation. To remedy this, Covenant’s designer chose a gray textured wood-look plank tile for the floor and used a mosaic border containing both the gray of the new kitchen tile and the beige of the existing tile to create an ideal transition and define the kitchen space. Wine storage and ice maker round out the amenities. Back splash and floor tile add textural interest. The backsplash tile containing circles of Carrara marble and glass with three intentionally placed ceramic sea stars sets the beach tone and plays well against the orange of the stove and wall. Bead board behind white open shelving that is painted a shade lighter gray than the island gives more visible texture. Steel Gray granite perimeter tops provide a great accent without being as harsh a contrast as black granite might have been. It's all in the details, color and texture are paramount. The whole look was created to be happy, sunshine-filled and reminiscent of summer days on the shore. The functionality of the room is timeless. · Don’t overlook lighting, it is important to both form and function and can be the jewelry of the room. · The use of a simple, beautiful door style helps keep the cost down, yet does not sacrifice good looks. · Don’t underestimate using a mix of distinctly different design elements. Modern and classic materials work well together, from concrete to beadboard to marble, stainless steel and punched tin. · Repeat design elements for continuity. Orange stove, orange painted accent wall. 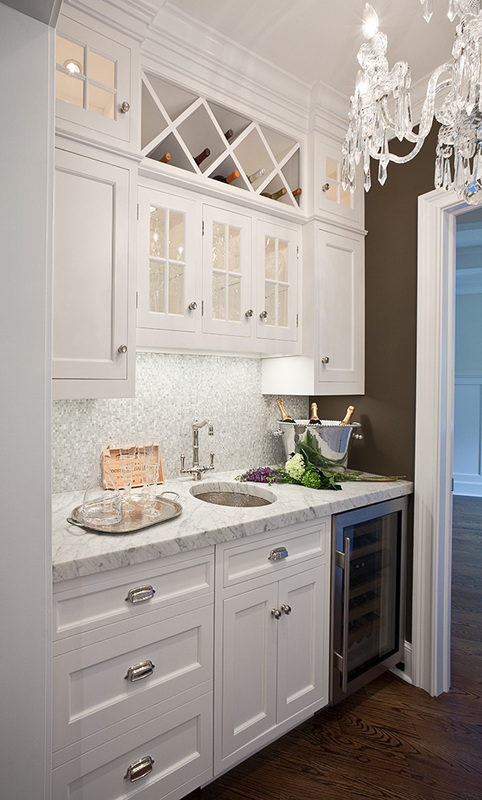 White Carrara island top, White Carrara in backsplash. Gray, black and stainless accents. · Select an unusual palette of colors against a neutral white or gray backdrop. Don’t be afraid to use a color you love. It was a desperate need for working appliances that actually led this homeowner on a mission to remodel her kitchen. Although there had been a few updates to this 1920’s Madison beach front home, the time had come to tap into some hidden potential and bring the kitchen and sun porch into the 21st century. The porch had a fiber board drop ceiling which when removed showed that the original ceiling followed the roof line and was beadboard, replacing the ceiling following the roof line with new beadboard kept the space in the period of the home. A pale robin’s egg blue on the ceiling is reminiscent of sky and draws the eye through the space ties in the kitchen walls which are another shade of that same blue. Wanting to take advantage of natural light, Ciccarello reworked theses spaces to create a cohesive plan, and a more casual feel. Door locations were changed to add much needed lineal feet to the stove wall. Opening the kitchen to the sun porch and dining rooms allows for beautiful sea views from each room. Soffits were removed and cabinets installed up to the ceiling, for more storage and visual elegance. Taller windows installed in the same opening bring in more light. Prior to this remodel the kitchen was dark and confining, even though the home owner is an avid cook with a love for taking cooking classes she hated to spend much time in the space. “It just was not a nice place to be” she says “it’s definitely a whole new house now, when you fix the kitchen, you get a whole new home”. The old kitchen did not have an island. There was limited counter space which made it tough to entertain. The new island and counters are a custom fit at 1” higher than typical which helps alleviates back issues. The perimeter countertops are soapstone and the island countertop is made from hand chosen wormy butternut from old barn floor beams with a rain shield finish. The layout and room flow is the customer’s favorite part of the space. 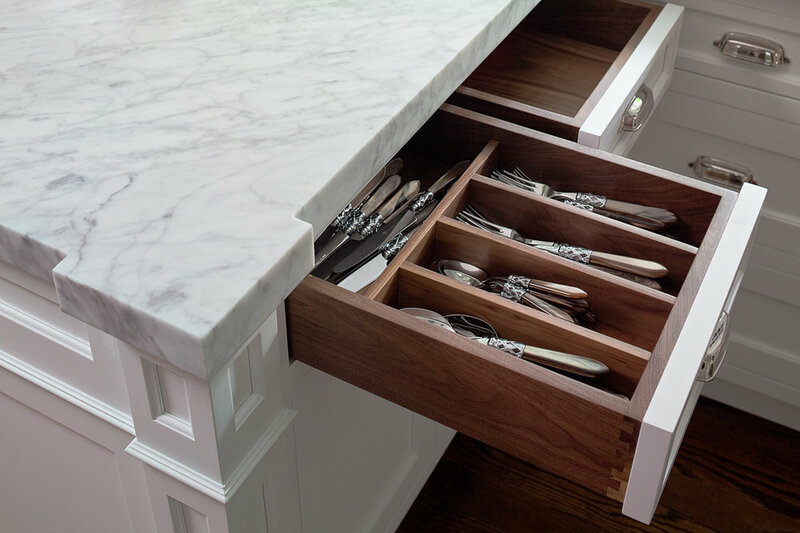 “I thought I would miss the butler’s pantry but I don’t at all”, she says “I have not even filled all the new cabinets yet, the new space is so roomy!” She adds, “It’s easy to work in, I never feel “stuck” in the kitchen. I love the island and mother of pearl and porcelain back splash”. She listed a few more items she is happy to have…big drawers under the cook top, large double ovens with a tray divider in the cabinetry above. There is a convenient coffee station with milk, coffee filters and cups all in one spot, everything needed for that morning wake up all in one location. The porch is now perfect for casual entertaining and is easily accessible. The table is so handy it feels like an eat-in kitchen. “I can line the grand kid’s highchairs up on the tile and not worry because it is so durable” says the home owner. The porch is family and grandkid friendly. New radiant heat under both the kitchen wood floor and the porch tile floor adds warmth and keep the space comfortable. 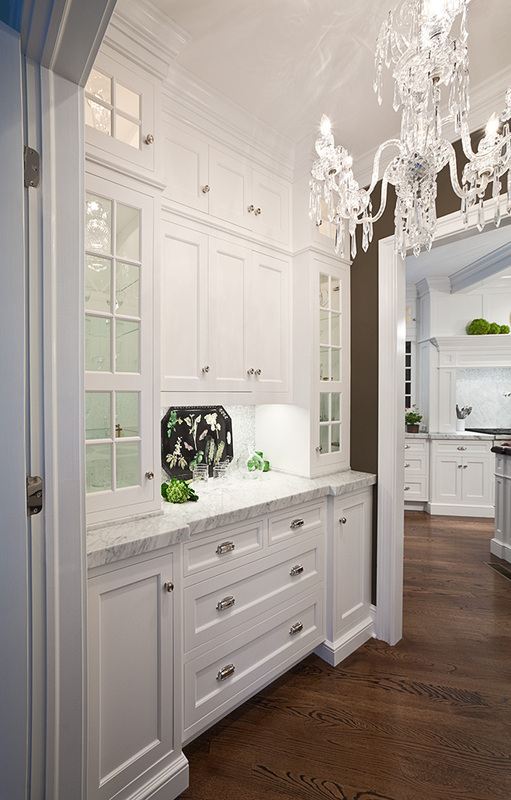 Now opened up, bright and pretty, the space regains freshness with the white cabinets set against blue paint. The color of each room works with the color of the adjacent room to create a timeless look. April 28, 2011 / Covenant Kitchens & Baths, Inc.
Dream Kitchen & Baths magazine’s cover on the 2011 spring issue is a Covenant Kitchen!! Showcased as one of the thirty timeless looks, this kitchen was one of the winners of the NKBA (National Kitchen and Bath Association) design competition in 2009. European travel influence newlyweds’ style sense. These newlyweds were combining two households and were searching for one voice for their collective style. Before they were married, life was simple - design-wise that is. Each leaned toward clean lines. to collect antiques from around the world. The objects they purchased were more “old world” than contemporary. Enter Covenant Kitchens & Baths in Westbrook. The designers there helped create a kitchen that would utilize the couple’s one-of-a-kind treasures. First there were some logistics involved. Moving the kitchen from the dark north side of the house to the spot where the dining room had been, next to the conservatory, made all the difference in the flow of the floor plan. The client’s purchased one large arched stained glass window from a 19th century church in England where they visited. Luckily, the window had a seam in it where it could be split neatly into halves, creating decorative panels for the doors that flank the AGA Cooker, which takes up an entire wall. Then there was the 100-year-old German blue and white tile that was a prize find on a recent trip to Europe. Only, there wasn’t enough tile to do the entire back splash. Mixing it with strips of black marble camouflaged the AGA’s black exhaust vent. Perfect! Formal and warm, the new plan combines both the open flow and the coziness they wree after. Larger work areas make entertaining a breeze. Recently they hosted a party where nine people gathered comfortably around the counters to make pizzas! This is Old World meets the New World. April 13, 2011 / Covenant Kitchens & Baths, Inc.
More than 300 New England architects and designers recently filled the Clarke showroom in Milford, MA for Clarke’s Fourth Annual Designer Appreciation Night. 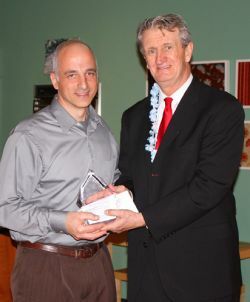 Gerard Ciccarello of Covenant Kitchens & Baths, Westbrook, CT receiving his top honors in The Clarke Design Awards from Clarke Director of Marketing Jim Raftus. Clarke awarded trophies to six top designers around New England for their innovative use of Sub-Zero and Wolf appliances in kitchens and other rooms in the home. Clarke’s top three specifiers were also distinguished for their leadership in integration of these high-performance ranges, cooktops, wall ovens, refrigerators, wine storage and more into their vision of what a kitchen could be. March 08, 2011 / Covenant Kitchens & Baths, Inc.
Every design project has it’s challenges and this was no exception to the rule for the designers at Covenant Kitchens and Baths in Westbrook, CT. This Old Saybrook eclectic colonial style home is unassuming on the outside but the inside has taken a beautiful bent toward the home owner’s contemporary tastes. The scope of this renovation was to gut and remodel the kitchen, powder room, master bath and a secondary bath. Upon its renovation the kitchen most definitely has become the focal point of the home. Angular and dated despite a bank of windows showcasing the view of the marsh, the kitchen seemed dim, small and cave-like. The homeowner wanted bigger appliances and a dramatic, contemporary look without changing the footprint of the kitchen or sacrificing storage space. “Being able to make the room seem larger without increasing the footprint of the home was tripping us up for a bit.” says Ciccarello, owner of Covenant Kitchens and Baths. “We came up with the idea to vault the ceiling and add a clerestory with transom windows to give a feeling of spaciousness and a look that was better proportioned to handle the larger appliances” he added. The ceiling, an often neglected surface, was vaulted with careful attention to the home’s exterior look. The clerestory immediately gave the inside space the dose of high drama that was desired by the home owner and some extra curb appeal from the exterior that was intentioned by the designer. Form and function being equally important, a perfect cache of extra space was gained for storage in the kitchen by recessing a tall pantry cabinet with roll out shelves into a little used closet space in the powder room. Staggered open shelves add visual texture and a place for the homeowner to personalize their space. Generous scale stainless steel appliances to suit the homeowner’s wish list grace the space with loads of functional amenities. Among their favorites are the six burner range with convenient potfiller, warming drawer in the island and wine chiller. The makings of a perfect party! An avid reader of Architectural Digest, the homeowner fell in love with a counter top material he saw in an advertisement for Concetto stone by CaesarStone Quartz Surfaces. He brought the ad to Gerard Ciccarello and inquired about using this product. The material is hand-made from individually cut semi-precious stones that are bound with a semiclear epoxy binder. The homeowner favored the brown agate material. The binder and parts of the agates are translucent. Ciccarello chose to back light the countertop (with fiber optic lights on a substrate beneath the stone) and use it as the pinnacle of the design. “My favorite projects are the more contemporary projects, even though times have changed and contemporary is more common, these projects are still a departure from the norm here on the Connecticut shoreline”, said Van Deusen. “Recently we are seeing more and more projects like this one where we get to use the latest greatest materials, to me it is the equivalent of an artist discovering a brand new color”, she says, “more room for creativity”. Previously outdated, dark and lacking drama this kitchen is now a sparkling updated masterpiece with personality plus! The homeowner is ecstatic about their space. They told us that they liked our portfolio photos but now nothing compares to their space. Over the past 20 plus years that Covenant Kitchens and Baths has been designing along the shoreline they have witnessed first hand the turn from using all traditional elements towards cleaner lines, simpler door styles and one or two pieces that really impact the whole picture. There is also a trend toward mixing elements of styles that works well, too. It is not uncommon to see a more contemporary light fixture in a more traditional room. If the pieces are in the right color tones and right scale the sky is the limit! Combining hall space with a closet and a small out dated bathroom we were able to create this elegantly understated ultimate bachelor suite in soothing shades of espresso and cream. The wish list included a generous sized steam shower with a seat, two lavatories, linen storage, a clothes hamper, a separate water closet and a large well organized and well lit walk-in closet. Honed Imperial Cream travertine tile laid on the floor in random size and pattern acts as a dramatic backdrop for the rich stained cherry vanity cabinet and is capped off with a travertine counter top including his and her sinks. Hammered bronze vanity hardware mimics the band of metal tiles surrounding the shower. Simple yet stately, cherry crown moldings grace the space and tie the cabinetry together keeping the over all look from being too fussy. Cherry door frames, pocket doors and a cherry display niche in the water closet add the finishing touches. Being an interior space without windows made the room quite dark. A unique solution to this was to create an interior textured glass window between the mirrors which allowed an adjacent skylight in the next space to flood the room with natural light while providing privacy. The heart of this suite features luxurious Kohler biscuit and brushed nickel fixtures and accessories including multiple rain tiles, a ThermaSol steam shower and a frameless glass door. An adjacent tall cabinet holds towels and other shower essentials. The generous eye pleasing closet portion of the suite boasts a place for everything and everything in its place and proves that form and function in equal portions will live blissfully ever after. August 10, 2010 / Covenant Kitchens & Baths, Inc.
We here at Covenant are very thankful for the work supplied through customers like you. Over the last 25 years we have sought to return the blessing of provision to the needy both here and abroad. We have been privileged to support fantastic organizations such as Habitat for Humanity, Community Music School in Essex, WOL youth camps in El Salvador and Chile, ABC Women’s Center, Project Graduation and many other excellent organizations. After traveling and helping several charitable organizations both near and far, we have been motivated to try to contribute more. We will continue helping our present charities but add two new organizations Samaritans Purse and Shoreline Soup Kitchen for our new international and local charities. For each project we work on we will actually give $200 dollars to Samaritan's Purse as designated by the client, (ie. $50 to mosquito netting to prevent malaria, $100 towards putting an end to child trafficking and $100 to buy chickens for a family to farm and become self sufficient) and we will also give $50 to The Shoreline Soup Kitchen & Pantries. Samaritan’s Purse is the organization we have selected as our new partner. Personally, our family has spent many Christmas seasons packing shoeboxes for Samaritan’s Purse’s program Operation Christmas Child. These boxes are sent to the less fortunate children in over 130 countries. Through these small gifts millions of children throughout our world have been blessed and realized that someone cares. The organization was begun in 1970 and in 1978 Franklin Graham, son of Bill Graham, became the president and CEO of Samaritans Purse. The Shoreline Soup Kitchens & Pantries, founded in 1989, is an interfaith ministry that provides food and fellowship to people in need and educates our communities about hunger and poverty. In 2006, 480,431 meals were distributed to individuals and families during various programs. The programs included grocery distribution sites, heat-n-eat meals, and meals at area soup kitchens. March 09, 2010 / Covenant Kitchens & Baths, Inc. 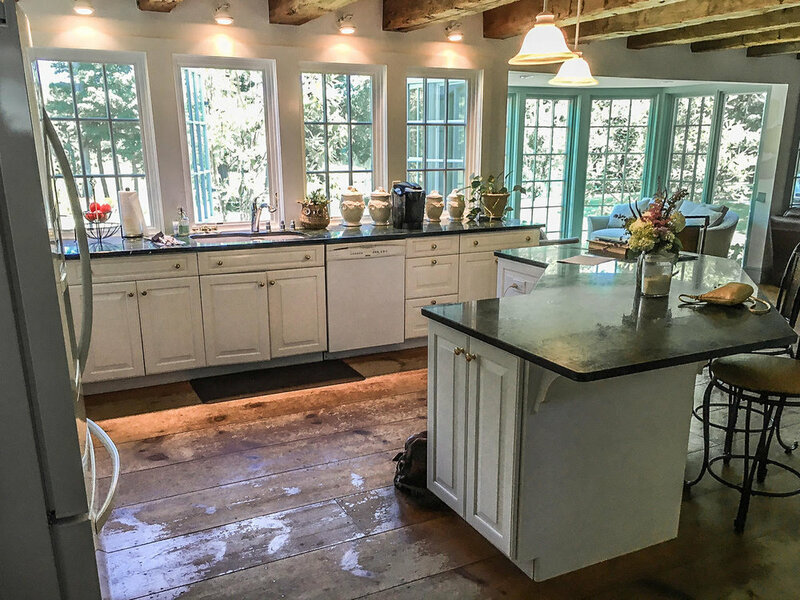 Designed to the period of the home, this kitchen was created to keep as much of the 1932 Cape Cod feel of the home as possible while giving it a completely functional update. The designer kept all the smallest details in mind including door styles, pulls, “icebox” latches and bracketed molding. All the details harken back to the earlier era. In keeping with the old house feel, fir floors stained in cherry provide some orange tones which are a nice foil to the blue-gray tones of the cabinetry. The choice of a galley kitchen versus a great room style kitchen was made again to keep with the look and feel of times gone by. In addition to keeping the kitchen as a committed food preparation area, having a dedicated room for the kitchen gives some definition in a home which otherwise has a very open floor plan. The kitchen boasts 28” deep soapstone countertops, a Shaw’s fireclay sink, a white Viking 36” range with matching white hood, 36”’ Sub Zero Fridge, freezer on bottom with integrated panels to match cabinetry. White appliances won out over stainless in order to keep that 1930’s feeling in the design. The hutch piece with a stepped out cherry countertop was created to showcase the owner’s pastel Fiestaware collection. The wood top on the hutch also pulls in the tone of the floor. February 24, 2010 / Covenant Kitchens & Baths, Inc.
Why not see the waterviews from the kitchen of this 1916 shingle style estate home? The designer planned a renovation that involved gutting the area and removing several interior walls in their entirety, a brick chimney chase that was no longer in use, unsightly soffits, an old butler’s pantry and some old cabinetry in order to make an open plan kitchen and new butler’s pantry with panache. The 36” Wolf range has a tile backsplash with an array of glimmering violet iridescent tiles which pick up the violet in the walls. The fridge is a Sub-Zero stainless steel all fridge unit and next to it under the counter is a Sub-Zero freezer drawer set. To the right of the sink is a trash compactor and in the island is a roll out receptacle for recyclables. A wolf 30” wall oven with Wolf convection microwave and lower Wolf warming drawer are at the other end of the space. The Pantry has a Sub-Zero under counter freezer with icemaker on one side and a Uline beverage center on the other. The work flow and function is amazing. There is now space for entertaining a crowd. There is a TV nook that is part of the kitchen and tends to be where the kids congregate while mom is busy in the kitchen enjoying the new view of the ocean accomplishing the designer’s original goal! February 22, 2010 / Covenant Kitchens & Baths, Inc.
2010: The master bath has never had looked so good. Neutral colors are often underestimated but when combined with expertise they can pack the perfect visual punch as they do in this Old Saybrook bathroom remodel. Covenant Kitchens & Baths, Inc. in Westbrook designed this space utilizing a blend of traditional and contemporary materials. Honed Calcutta Gold marble on the floor and burled maple doors on the vanity are typically associated with more traditional spaces but they work amazingly well with the more contemporary style elements of Caesarstone countertops and tub deck along with concentric rectangular natural stone tiles on the shower wall. Deep beige walls provide a dramatic backdrop for the swirling tans and whites of the stone while a burst of color comes into the space through the use of accessories. Blue towels and burgundy accents can add some spice or changing to greens and aqua tones for spring, the rich marble and stone tile accents work equally well with a variety of colors. A skylight over the jetted tub keeps the room bathed in light. The footprint of the room did not change, the room was gutted and the existing bathtub was reused for the remodel. Changes included the addition of a marble tub front and quartz deck giving the bath a brand new attitude. Frameless glass shower doors showcase the tiled shower wall as the focal point of the space while state of the art shower fixtures give a boost the functional side of the room. The "Before and After" photos tell the story...Seeing is believing! That is an understatement, this is a fresh look indeed.